Samsung has announced today that it’s going to launch its new Q9S 85-inch 8K QLED TV later this year. This is the first TV from Samsung to feature its 8K artificial intelligence technology. The AI enables the TV to upscale any video content to 8K resolution. It uses a proprietary algorithm to adjust the screen resolution based on the picture quality of each scene. It can thus continuously improve picture quality can upscale any content from any source into 8K. UHD TVs are still not ubiquitous so it’s going to be a while before 8K TVs become popular or even affordable for that matter. Even if you got your hands on one, there isn’t a lot of 8K content out there that can take full advantage of the TV’s potential. This is where Samsung’s AI technology steps in. Samsung claims that it will enable users to enjoy video content in 8K resolution regardless of its native resolution or method of transmission. The AI has a database which studies millions of images in advance to upscale low-resolution content into high resolution. If it’s fed with a source in low resolution, this feature automatically selects the optimal filter and converts the source into a high-quality image. 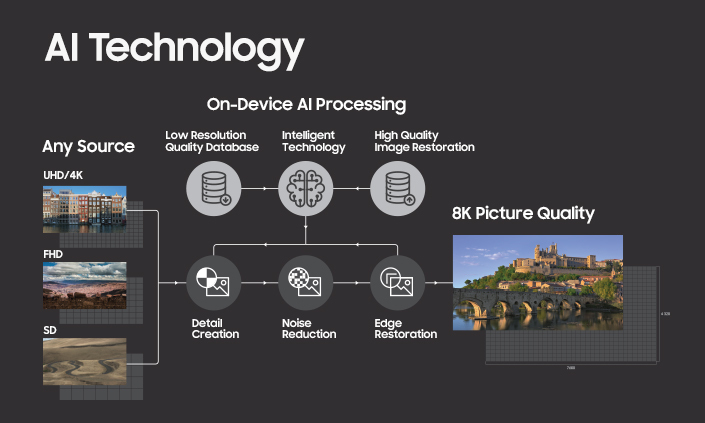 It then increases image processing 64 times to help provide natural images in high resolution without compromising gradation in the picture. 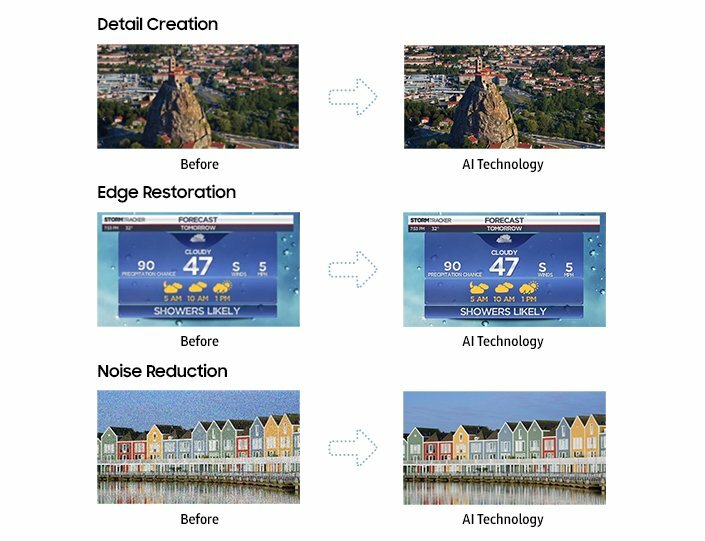 The TV categorizes elements of picture quality (black/blooming/brightness) in input sources to produce pictures that have richer and more detailed contrast. This enables the edges of text to be rendered sharp. The AI technology doesn’t stop there. It even enables the TV’s sound to be optimized for specific scenes automatically. For example, the cheering of spectators is amplified when watching a football game to recreate the excitement of the match. Samsung has confirmed today that its 8K QLED TVs with AI technology are going to be launched in the second half of this year with screens larger than 65 inches. The company hasn’t actually shown off the Q9S today so there are no pictures of it from CES 2018. Samsung did say that the design is going to be similar to the $40,000 85-inch 4K easel-style TV that it launched back in 2013. That’s one way to use AI. But that’s gone take hell lot of processing power.